It’s back! Whether she is a Jill (female) or a hob (male) this young ferret has to go! 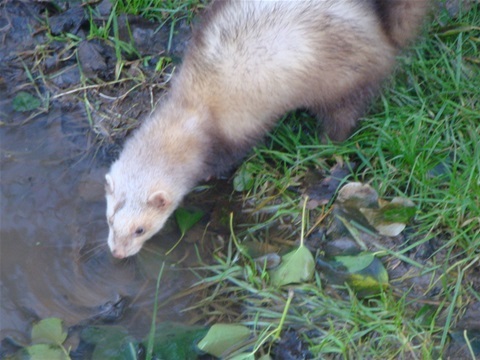 From time to time, polecats and ferrets visit our home for waifs and strays. I always know they are there, by their scent. They stink! And this particular fellow has taken up residence in our log store. I could smell him long before I saw him and only hope there wasn’t a business (group) of ferrets hiding out of sight. As cute as they seem, especially kits (under a year old) ferrets are not a good idea to have with hens. And so the day has began by trying to catch the wee mite before he starves to death or worse still, makes a meal out of one of our girls. A horrid thought! You see, ferrets have become domesticated and have no idea how to survive in the wild so we will take him to the small animal hospital in the woods to see how he is doing as they do tend to suffer from extreme health problems. This crepuscular creature sleeps 14–18 hours a day and wakes around dawn and dusk. So I guess we will have to coax him into a box with plenty of tasty food. Hopefully, with as little stress as possible as they react, just like skunks when frightened. However, these small animals, when excited, can perform a war dance, known as the weasel war dance. They do a series of frenzied sideway hops and are quite oblivious to the things they bump into and at the same time they make clucking sounds known as dooking. Excitement has taken over! It is an invitation to join in and play. I will let you know how we get on as soon as there is some news.